Come join the Odd Fellows Lodge #43 for a taste of Cajun Country with a celebration of Mardi Gras and Cajun delights. We’ll be serving up Gumbo, Jambalaya, salad, Cajun themed desserts, Honey Island Swamp Water, and a full bar. We’ll have live music provided by Annie Marie’s Fiddlaround Quartet for you to dance to, and all the fun you can handle. There will also be door prizes and raffles for really cool themed gifts and items. Doors open with cocktails at the Odd Fellows’ Speakeasy starting at 5 p.m.
Dinner and Dancing starting at 6 p.m.
We’ll also be giving tours of a historic building in Vallejo – the145-year-old Odd Fellows Lodge Building. This is a fundraiser to help Vallejo Odd Fellows Lodge to keep this Vallejo City landmark functioning and set for the future. Early Bird Discount until February 4th! 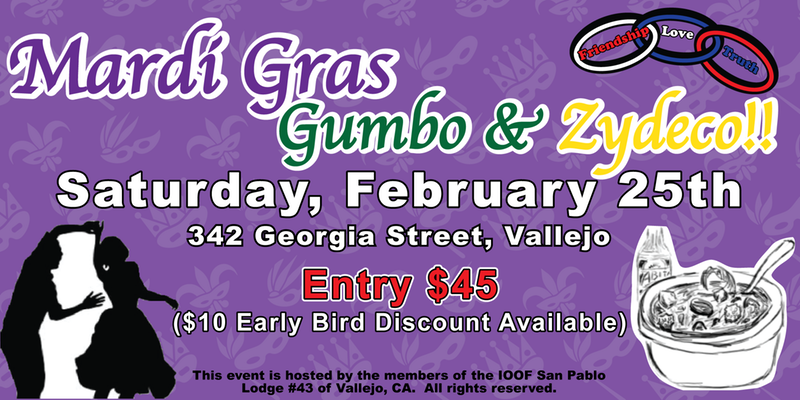 This event is hosted by the members of the IOOF San Pablo Lodge #43 of Vallejo, CA. All rights reserved. The IOOF San Pablo Lodge #43 reserves the right to refuse admission or eject anyone that is not complying with safety or standard code of conduct rules adopted for the event. All instructions by Event Staff must be followed. Previous Previous post: The first edition of the Inside Guardian is here!